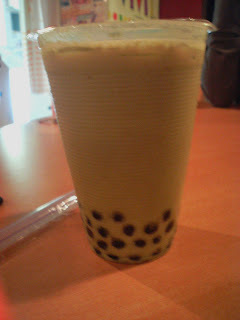 Japanese green milk tea with BOBA. Just to clear cla's name... yes, that small round black thingy at the bottom of the drink is called BOBA in the US (who the hell came up with such a name anyway??). p.s: Apparently, cla likes to make up her own words or mumbles something incoherent for the human ears, people thought 'boba' is another one of her creation.